Intensely vanilla this is the standard never fail classic. The difference between now and years past is the ability to do this in a machine on your counter top. No more packing ice and salt into the outer rim of the freezer, no more dripping the fresh made cream onto the grass and having the dog lick it up and chase you for the dasher….although those were good times and good memories. You start by heating the cream and sugar then whisk in the yolks and cook till it coats a spoon (or registers 180 on a thermometer). Draw your finger along the back of the spoon and if it creates a channel (as seen below) it’s done. 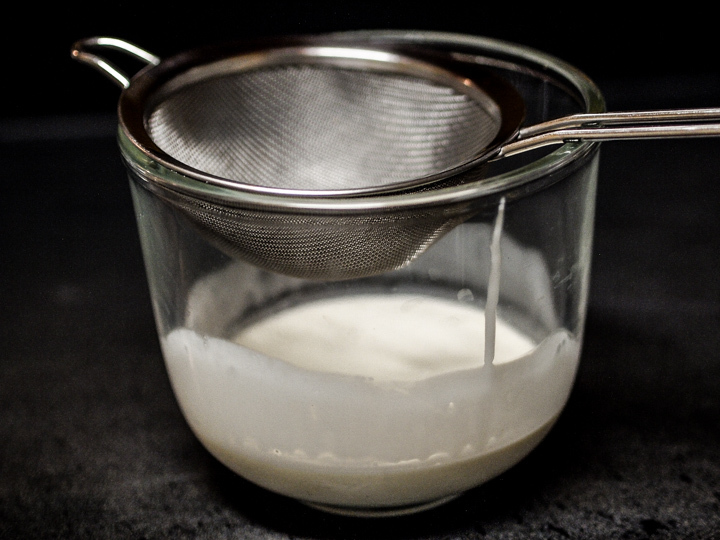 Take the cooked mixture above and pour through the strainer into the remaining cream. This will strain out any curdled parts but for God’s sake don’t toss the bean! Rinse it off, let it dry and reuse it by putting it in the sugar bowl or dropping it in a bottle of cognac or bourbon where it will continue to perfume the contents. After the cook and the strain you’ll end up with a custard mixture which needs to be cooled down fast either in an ice bath (submerging the custard in a larger bowl packed with ice) or the lazy man’s way parked on a cold compress from the freezer as seen below. This is easier and less messy than the ice bath, so just pop it on, stir and blow for a couple of minutes then put it in the fridge and let it cool for a couple of hours or overnight. Now all that remains is to get the ice cream maker out, plug it in, pour it in and in another half and hour you’ll have your very own little artery clogging bowl full of heaven. Enjoy it with Orange Almond Crisps or some sliced fruit. 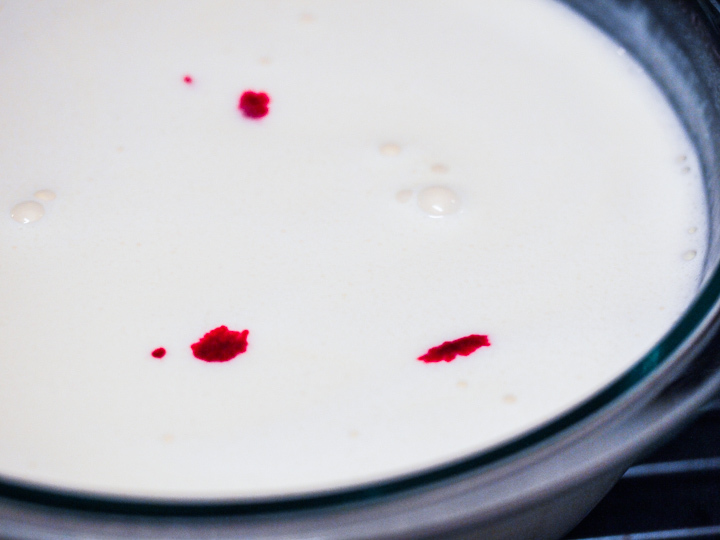 Heat the milk, sugar, salt, and 1 cup of the cream over low heat till the sugar is dissolved. Take the tip of a knife and run it down the inside of each half of the split bean, getting as many seeds into the cream as possible. Then drop the bean in and let the mixture stand for 30 minutes. In a top section of a double boiler beat the yolks. Incorporate the warm cream mixture gradually into the yolks. 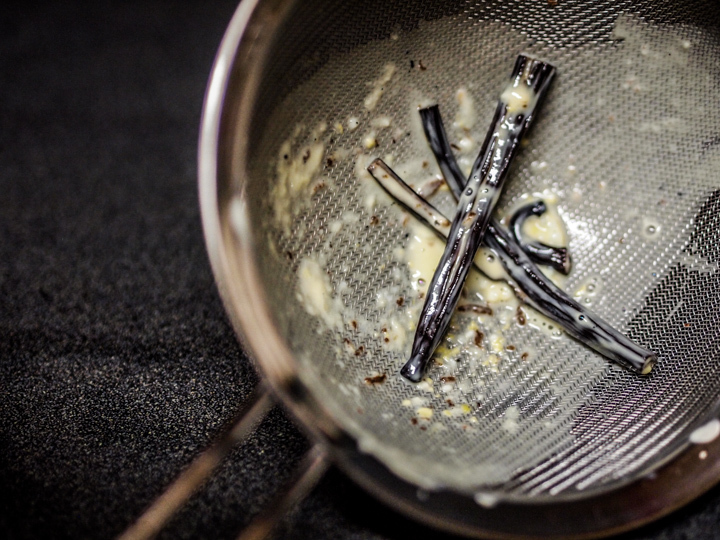 Whisk well and cook over a low heat till it thickens, taking care never to let it boil. When it coats a spoon it’s done. 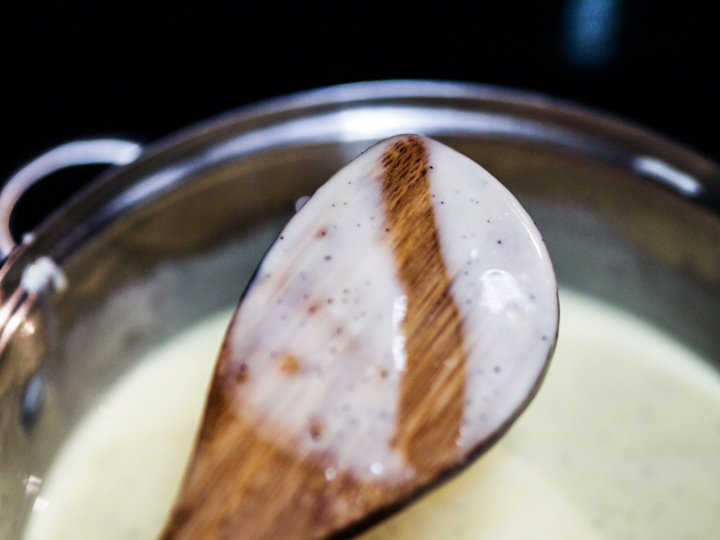 Now strain the cooked custard into a bowl containing the other cup of cream and the vanilla. Put that bowl into an ice bath and mix well. When it’s cooled somewhat, cover with plastic wrap and put into the fridge till very cold. Put the finished ice cream into a container that has been chilled. Do not try and cheat by skipping the bean. It will not taste the same. And it’s preferable to buy the bean from a spice merchant or a grocery store with a quick turnover, which will insure that the bean is fresh. If the custard starts to boil, take it off the heat. And don’t worry. Straining it will eliminate the curdled parts. I invented this one Christmas when I was running low on white sugar and high on cane syrup and it turned out to be the best possible way to use up Steens. 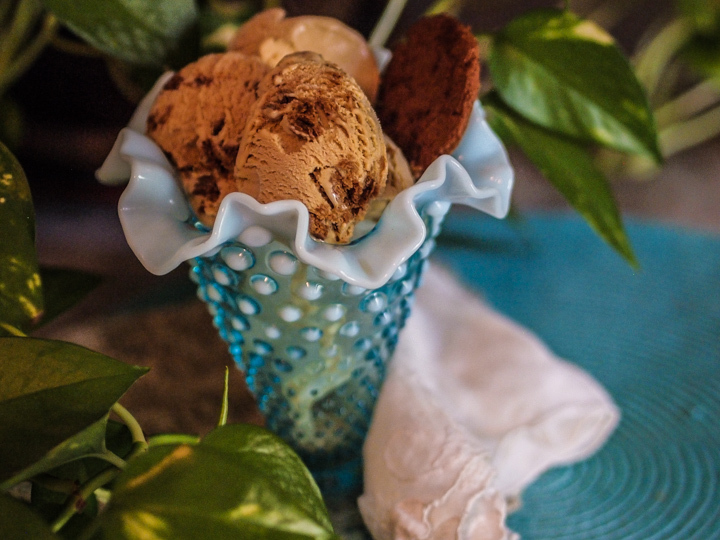 It’s nothing more than simple cane syrup ice cream studded with gingersnaps. You can make it at any time of year but it’s especially nice around the holidays since it tastes like gingerbread. The smoothness comes from the combination of the syrup and the cornstarch. One of the reasons homemade ice cream tastes better than store bought is the custard base. This adds a step to the process, not to mention the extra time and the expense of the egg yolks. Most commercial ice cream makers can’t charge enough to make a profit on custard based versions so they don’t make them. This is the reason amateur ice cream makers usually churn out product that’s superior to the pros. Because they can afford to. What stops many of them though is the near universal fear of curdling. No one wants all their effort and expense to end up as a pot full of runny sugary scrambled eggs. But fear not! This problem can be largely avoided by the use of a thick bottomed pan and/or double boiler, moderate heat, and constant stirring. And the stirring time is mercifully short since the eggs do cook quickly. And last but not least there is the strainer. No matter how careful, no matter how low the heat, you will end up with a few curdled squiggles. That’s why you’ll pour it through a strainer. That way no one will ever know. So for this recipe you’ll want to start heating the cream, then in another bowl whisk vigorously the yolks, cornstarch and syrup until completely smooth. When the cream warms to the point where it’s hot(ish) but still not too hot to stick your finger in, go ahead and ladle some of the cream into the egg yolk mixture. This is called tempering. I think of it as squiggle reduction because it will warm the yolks without cooking them and causing the scrambled egg effect. After you’ve added two or three more ladles of cream and mixed it well, pour the cream and yolk mixture back into the pot with the cream. 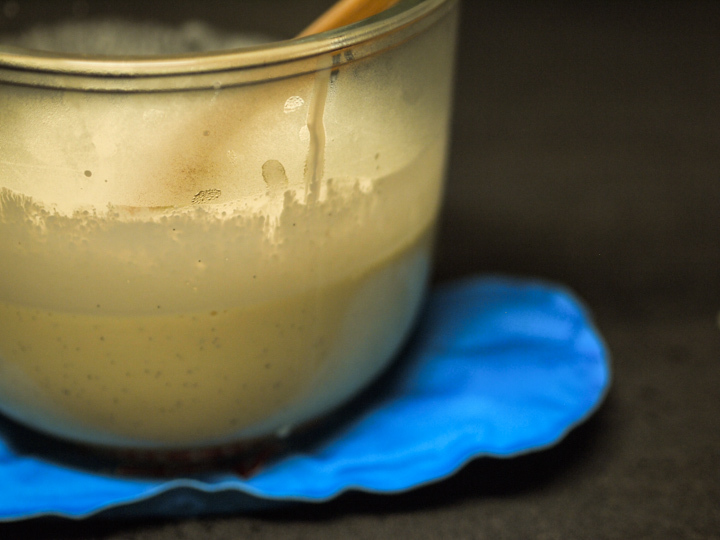 Stir until a thermometer reads 180 or until you see the first bubble pop on the surface. One fail safe way of testing doneness is the old “coats a spoon” routine. When the custard starts to visibly thicken pull out your spoon. Does a thick layer adhere to the spoon? Yes? Now take your finger and run it down the back of the spoon right through the middle. If it creates a channel that stays you’re done. Think Moses. Parting of the waters. Like that. At this point you strain it into a bowl, add the cold half cup of milk and stir a bit to cool. When it’s no longer hot add the vanilla, cover with plastic and put in the fridge for several hours. When it’s good and cold freeze it according to your ice cream freezer’s directions. Right before the end add the broken sifted cookie chunks and you’re done. Because of the slightly larger amount of sugar (in the form of syrup) in this, the finished product will be somewhat softer than other ice creams so make sure your freezer is at its lowest setting to harden it up properly. Combine yolks, cornstarch & syrup and beat well. Add cold milk and vanilla extract. Strain into a bowl and let cool off a bit. Cover with plastic and chill thoroughly in the fridge. Break the cookies up into medium sized pieces. Do a quick sift to get rid of the tiniest crumbs. The final product will look better. Pour the custard mixture into the ice cream maker and freeze according to directions. 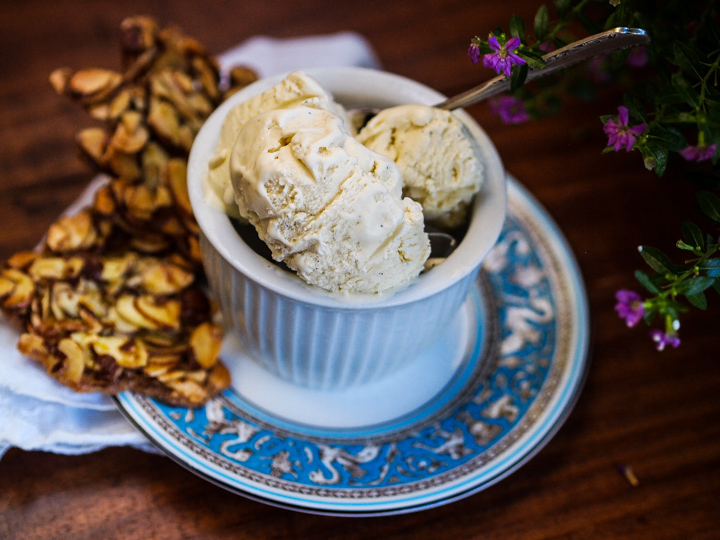 When the ice cream is almost frozen, add the cookies. Serve with a small dusting of sea salt on top. You can use other cookies in the spice family as long as they’re thick and hard like gingersnaps. 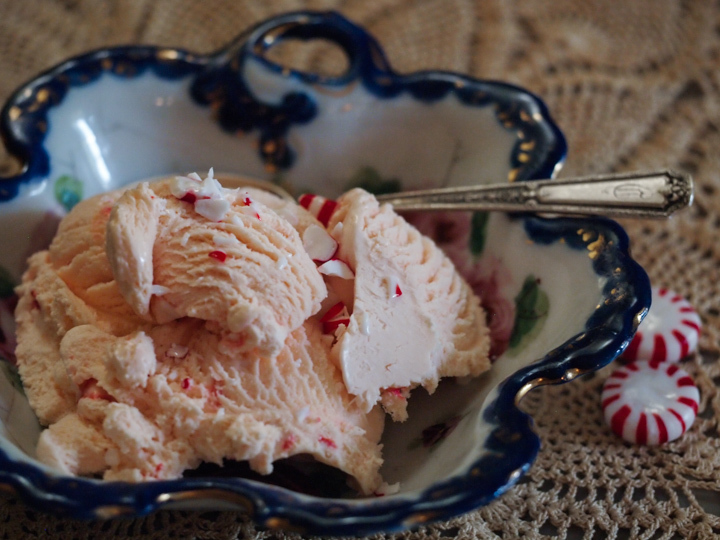 Peppermint Stick Ice Cream seems to be one of those old fashioned ice cream flavors that’s been cast aside to make room for the weird. Pomegranate Cookie Dough or Cilantro Swirl anybody? Okay, maybe I’m just joking there, but when you have a classic flavor like this it shouldn’t be forgotten. This is a rich vanilla custard base with some kick from the peppermint/almond extract and some crunch from the candies. That’s it and that’s all. A little sweet striped piece of kidhood to cool you off and appease your inner child. Actual kids will like it too. When I tell people about this recipe I get the same response across the board. It’s always along the lines of, “I used to love this and now you can’t find it anywhere anymore!” Well, consider it found. Same stuff as they use on CSI episodes I’m sure. Anyway, mix it to your preferred degree of pinkness, add the extracts, cover with plastic and chill. While the blood splatter is chillin, you can have a go at the candies. I wrapped mine up in a dish cloth and bashed them with the wimpy female type hammer you see in the shot below. If you’re a man making this recipe you can drop them in a Hefty bag and back your truck over them. Whatever works for you. So when the custard is chilled, freeze it according to directions and when it’s almost done drop in the candies and prepare to revisit your childhood summertime memories. Combine yolks & sugar and beat till pale. 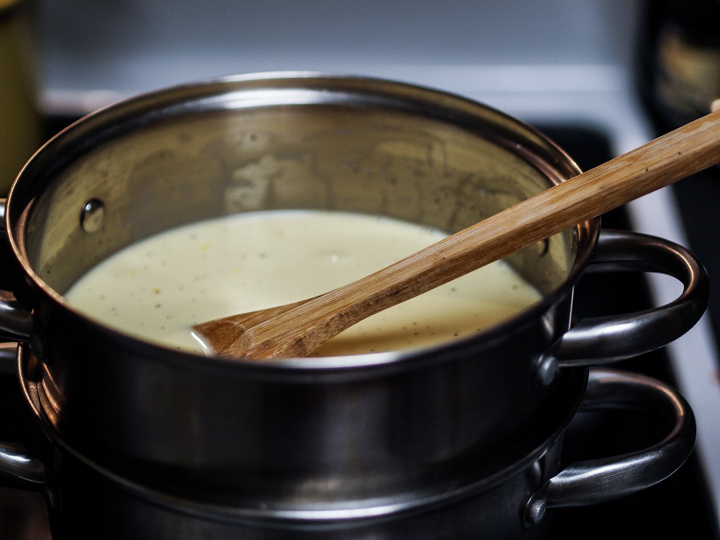 Combine milk & cream in double boiler and bring to a simmer. There should just be wisps of steam coming off of it. Now ladle about half a cup into the egg/sugar mixture to warm the eggs. When that is fully incorporated add the remainder of the yolks and stir over a low heat till the custard coats a spoon. Add extracts and food coloring. 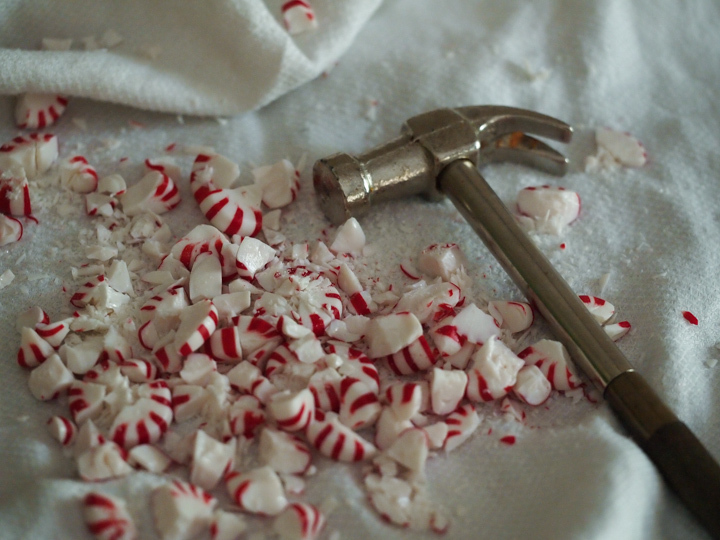 Put the candies in a dish towel and bash with a hammer till the desired level of pulverization is achieved. When the ice cream is almost frozen, add the candies. 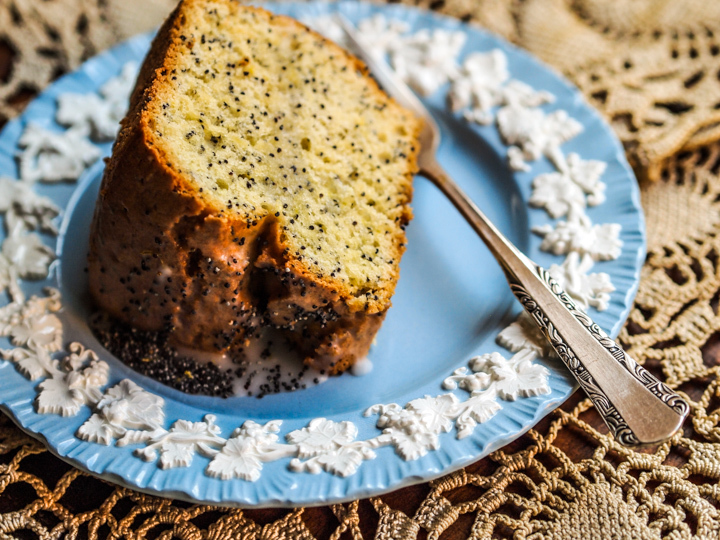 Everyone needs a reliable Poppy Seed Cake recipe in their culinary toolkit and this one is a good basic variation on the Maida Heatter version. Nothing, however, can quite beat my first “Poppy Seed” cake. I only assisted in the preparation of this fraud but it provided a valuable lesson in exploring the limits of improvisation. It was some family gathering – don’t remember the occasion – but people were multiplying at my grandmother’s house and food was rapidly running out. My aunt started to rattle through the cabinets looking for something, anything, that could be offered up to the hungry when she caught sight of a box of cake mix. “That’ll do” she said. “Now go get some eggs and corn oil and we can get this stuff going.” By the time I got back to the mixer with the supplemental ingredients my aunt had opened the cake mix. At that point she fired up the mixer, minced the orange slice that she’d removed from her Old Fashioned, dropped that in, then poured a couple of tablespoons of the actual drink into the churning insect vortex, and presto! Old Fashioned Poppy Seed Cake was born. Not even the maraschino cherry went to waste as it ended its life garnishing the top of the cake. It was a great success. Everyone remarked on its “unusual flavor” (thank you Bourbon and Angostura bitters) although one of my uncles suggested that it “could do with more poppy seeds next time.” My aunt just smiled and promised to remember. So my take away from this experience is that the eatable and the entomological can happily co-exist – as long as nobody finds out. Butter & flour a tube pan. Cream butter well, then add 1¼ cup sugar and cream well. Add egg yolks one at a time incorporating well after each addition. Mix together flour, baking soda, baking powder and salt. Add 1 cup of the flour to the butter/sugar/egg mixture. In a separate bowl, mix the sour cream, poppy seeds, vanilla, almond extract, lemon rind. and lemon juice. Add to the butter/sugar mixture along with the remaining flour. Set aside. In another bowl beat the egg whites till foamy, then add the sugar and cream of tartar. Beat till stiff but not dry. Now fold the whites into the batter, fill pan, and bake for about 55 minutes or until a toothpick comes out clean. Beating this thoroughly at every step of the way is critical since much of the rise comes from the air you've beaten into the butter, eggs and sugar. The finished batter should be pretty light. You can substitute full fat yogurt for sour cream and cake flour for the all purpose flour but the final product lighter and less dense. Baking time will be less if you divide the batter between two loaf pans. This is great alone or with vanilla ice cream. However, if you want a simple glaze get some powdered sugar and add vanilla and/or almond extract and a little lemon juice all to taste. You can also sprinkle a little extra poppy seed and lemon rind on top of the glaze.